I was delighted to see that the GNOME Census presentation I gave yesterday at GUADEC has gotten a lot of attention. And I’m pleased to announce a change of plan from what I presented yesterday: The report is now available under a Creative Commons license. Why the change of heart? My intention was never to make a fortune with the report, my main priority was covering my costs and time spent. And after 24 hours, I’ve achieved that. I have had several press requests for the full report, and requests from clients to be allowed to use the report both with press and with their clients. This solution is the best for all involved, I think – I have covered my costs, the community (and everyone else) gets their hands on the report with analysis as soon as possible, and my clients are happy to have the report available under a license which allows them to use it freely. You can download the full report now for free. The take-up on the GNOME Developer Training sessions at GUADEC (pdf brochure) has been below expectations. Without going into the details, we’re in a situation where running the training would cost the foundation and the organisers more money than canceling. If we have not had a number of people sign up for the training by Wednesday evening, we will unfortunately be in the situation where we will have to cancel the session. The GUADEC organisers sign the final contracts with the university for room reservations on July 1st, and that will increase our costs substantially, so that is our deadline for viability. I hesitated for a long time before writing this blog. It’s never nice to have to admit that something you thought was a good idea, that you put together and made a reality, might not work out. Many people have, over the years, said that the lack of training options was a major flaw with GNOME. With this training offering, we gave people what they were asking for, with a two day training course plus the flagship GNOME conference for less than you would pay to attend another technical conference. If we cancel this training session, there will likely not be another. The credibility of the foundation (and, I suppose, my credibility) will take a hit. I decided to let people know in advance that the session is likely to be canceled, to have a chance to stop that from happening. I have confidence that the GNOME community can come to the rescue here, in some sense. I am sure that there is interest out there. Perhaps people have not yet gotten budget commitments to send developers along, but that they’re still working on it. Perhaps there are people who really should know about the training who don’t yet, because I haven’t managed to get in touch with them. Perhaps a couple of people were planning on signing up, but haven’t gotten around to it yet. If you are in one of these categories, please get in contact with me soon. If you know someone who would benefit from the training, please let them know, and point them to the brochure and web page. If I have a relatively small number of commitments to attend by Thursday, the training will go ahead. Thanks everyone for your help and support – I will keep you posted to any new developments. I’m delighted to announce the availability of GNOME Developer Training at GUADEC this year. It’s been brewing for a while, but you can now register for the training sessions on the GUADEC website. Fernando Herrera, Claudio Saavedra, Alberto Garcia and myself will be running the two-day course, covering the basics of a Linux development environment and developer tools, the GNOME stack, including freedesktop.org components, and the social aspects of working with a free software project, being a good community citizen, getting your code upstream, and gaining influence in projects you work with. The developer tools section will go beyond getting you compiling the software to also present mobile development environments, and the tools you can use to profile your apps, or diagnose I/O or memory issues, dealing with the vast majority of performance issues developers encounter. This is the first time I have seen a training course which treats the soft science of working with free software communities, and given the number of times that people working in companies have told me that they need help in this area, I believe that this is satisfying a real need. We are keeping the numbers down to ensure that the highest quality training & individual attention is provided – only 20 places are available. The pricing for the training course is very competitive for this type of course – €1500 per person, including training, meals and printed training materials, and a professional registration to GUADEC, worth €250. If you register before June 15th, you can even get an additional discount – the early bird registration price is only €1200 per person. I’m really excited about this, and I hope others will be too. This is the first time that we will have done training like this in conjunction with GUADEC, and I really hope that this will bring some new developers to the conference for the week, as well as being a valuable addition to the GUADEC event. I’ve been working on a project for the past few weeks, and it’s time to take the wraps off. For as long as I’ve been involved in GNOME, we have been asked the same questions over and over again: How many GNOME developers are there? Which companies invest in GNOME, and how much? Where can I go for professional GNOME development services? And for as long as I’ve been involved in GNOME, the best answer that we can give is pretty hand-wavey – we talk about hundreds of developers, thousands of contributors, the advisory board, an ecosystem of expert independent companies, but we never do get around to putting meat on the bones. I decided that we should do something about that, and so for the past few weeks, an intern called Vanessa has been working to help me dissect the underbelly of the GNOME project. What is the GNOME Census? Who develops GNOME, and what do they work on? What does the GNOME developer community look like? How many GNOME developers are there?And how many contributors doing things other than development? What companies are investing in GNOME, and how? Are there modules where companies are co-operating, or have contributing companies been concentrating on disjoint parts of the project? Finally, if you’re a company looking for expert developers for custom GNOME development, where should you go? What does the commercial ecosystem around the GNOME project look like? We’ve been using tools like gitdm, cvsanaly and artichow to get some nice quantitative data on modules in GNOME git and freedesktop.org repositories. We will be running a survey of GNOME developers, and doing one-on-one interviews with key people in the GNOME commercial ecosystem to go beyond the figures and get some qualitative information about future plans and priorities as well. So why take on the project? Well, it seemed like fun. Answering interesting questions is always challenging and interesting. And it also seemed useful – if people are always asking for this information, there must be a reason they want to know, right? When the report is eventually available, I will be selling some copies to recoup costs. When I have sold a sufficient number to cover the cost of the project, I plan to release the report under a Creative Commons license. Those who are eager to get the results and information sooner rather than later will subsidise the availability of the report for everyone. I have submitted a proposal for GUADEC to present the conclusions of the report, and I anticipate that it will be available under a free licence by then. ISVs are interested in knowing how active projects are before committing resources. The GNOME Census will help reduce the uncertainty when choosing GNOME as a platform. GNOME distributors will be able to leverage this report to show the vibrancy, size, activity and commercial ecosystem around the GNOME platform. For companies who have been long-time investors in GNOME’s success, the census will give them well-deserved recognition, especially in areas where that investment has not been very end-user visible, but has had a huge effect on the quality of the user experience. Finally, for companies building software platforms on top of GNOME, and for companies in the GNOME commercial ecosystem, this report will allow swift identification of service providers with a high credibility level through their involvement in GNOME and the core developers who are working for them. We will be launching a survey this week asking GNOME developers who they work for, and whether they have worked for other companies previously – because of the widespread use of gnome.org email addresses in GNOME, unfortunately it has not always been easy to identify companies behind the people. We also want qualitative information on projects you work on, whether you work on GNOME in your free time, and more. We are be breaking down GNOME development by core platform, external dependencies, GNOME desktop, GNOME hosted applications and other GNOME applications. Vanessa will be sending out a very short survey to everyone who has committed to GNOME, and we need your help to make the census as useful as possible to the GNOME project. GUADEC Call for participation deadline – arriving fast! I just realised this morning that after a very long call for participation period, we’re now in the last week before the call for participation deadline for GUADEC – you should have proposals in by 23:59 UTC on March 20th to be eligible for selection (although a little birdie tells me that might get extended to the end of the weekend). Of course, I knew that the deadline was sometime in the end of March, but I didn’t realise that we’d gotten so far through the calendar! So get your proposals in about all things GNOME, GNOME 3, GNOME Mobile, usability, accessibility, webability, open data, free services, scaling the community, developer tools, whatever – but get them in quick. It’s better to get a poor proposal in now & improve it next week than wait until next week to polish what you have now. For guidelines on a good talk proposal, I really like the OSCON guidelines as a list of good dos & don’ts for conference proposals – in general, make the proposal (and your presentation, if accepted) not about you or your project, but about your audience and what they can do with your project – so clearly identify the target audience & why they would attend, and make the title short & action-based, rather than vague, weird or overly clever. Good luck to teuf and his merry band evaluating all the proposals! The last in the series! After Mobile Day on Wednesday, I chilled out on Thursday morning, and attended the GNOME Foundation AGM where I gave a quick report on GNOME Mobile, before heading off to play in the fourth annual FreeFA world cup, with the mad dogs and Englishmen who went out in the midday Gran Canaria sun to play football for 2 hours. Another highlight of the match was Diego, ending the match without breaking a sweat, finally broke a sweat just as we were taking the group photo at the end. Thursday evening, met up with Federico Mena, and Jonathan and Rosanna Blandford for a very interesting hippie BOF, with conversation varying across a bunch of subjects, including compost heaps, growing trees and herbs, architecture pattern languages, cultural variations in building design, and more. On to dinner, and home to the hotel early, ready for the cycling trip on Friday. Up early on Friday, down to breakfast, no sign of Aaron or J5 yet, so I start eating without them, and go get started with the bike. Turns out we were sitting in different parts of the lobby in the Fataga. Armed with bikes, we set off around 9:30 to get to Arucas, on our way to Teror. We made pretty good going of it along the waterfront, and after taking it fairly easy on the edge of the motorway (surprising that we could cycle there actually, but apparently that’s the only way to get where we were going) along the coastloine, we finally came to the intersection for Arucas. John was starting to find the going a little tough already, but nothing had prepared us for what was next. The nice straight GC-20, from the coast to Arucas, was steep, much steeper than I had expected (if I had to guess, I’d say an average of around 8% with some bits around 10%). It was a struggle, but we got to the top, before a nice long downhill stretch to come into Arucas, after which we all needed a water stop. We agreed that the goal of Teror (600m higher and 15km further on) was probably not realistic, so we decided to cut across on the GC 300 to Tamaraceite, grabbing lunch in the first village we came to on the road. And so we set out after a nice long break & a walk around the “cathedral” in Arucas, the town gardens and the main shopping district (with a detour by a farm supplies store) for what we thought would be a nice light 20 minute cycle to the next town over. No such luck. After climbing a nice hill straight out of Arucas, we had our reward – a really nice winding fast descent towards Tenoya. But when we got up to the village of Tenoya, we couldn’t find a restaurant anywhere. Eventually a nice old man pointed us towards “la cantina”, which turned out to be a bar with some very nice young men standing outside calling us crazy. So we decided to go to the next village over. Through a road tunnel – watch out for the oncoming cars! Traffic lights don’t know about bikes going through and we didn’t have lights. then we got to a sort of service station with a promising sign: “Supermarket in Las Mesas: 500m”. If you ever come across that sign, don’t believe it. Between us and lunch was a killer hill and 2km of dusty road. We settled in to la Cantina to weather the hottest part of the day, had some nice lunch (food always tastes better after physical effort) and set off again to get back to Gran Canaria. Getting around Tamaraceite was a bit tricky, we took one or two wrong turns before finding the nice small back road to get us on the right track. Then one last killer hill, up the Cuesta Blanca to the major shopping district, and then downhill all the way through the roundabouts, right down to the hospital near the golf club, and home. It was a great ride, lots of fun, and I’m happy I made time for it. Aaron & John were great partners. After that, packed my bags, out for dinner with Lefty, home to bed quite early, and up with the birds for an early flight, when I got to run into lots of GCDS attendees in the airport – a nice breakfast with Guy Lunardi, Jonathan & Zana and Owen Taylor (IIRC), and I was off on my plane once more. Homeward bound, for a few days, before heading off to OSCON and the Community Leadership Summit. 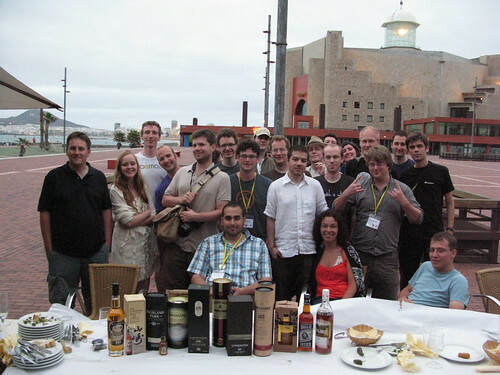 Nearing the end of the series on the Gran Canaria Desktop Summit. On Wednesday morning (after SMASHED), we had to get to the new location for the conference. I missed the bus window of 8am to 9am, so I took a taxi, without knowing the address of where we were going, other than knowing that it was the “Gran Canaria university, informatics building”. Turns out that’s not enough information for a taxi driver Anyway, got there eventually, late for the opening session, and a little more expensive than expected. I also lost some change down the back of the bucket seat, so he even got a tip. Designing Moblin-Netbook. A free desktop on a 7-10″ Screen, by Nick Richards: Great overview of the Moblin platform, and the design principles guiding it – from design requirements, personas, and dealing with constraints. Hildon desktop in Maemo 5 by Kimmo Hämäläinen: An overview of the Hildon desktop on a whiteboard by Kimmo. MAFW: the Media Application Framework for Maemo by Iago Toral: Drilling down into the details of MAFW. Why its easier to re-invent rather than participate on the mobile? by Shreyas Srinivasan: My favourite presentation of the day. Shreyas laid out what he had expectied from GNOME Mobile, the problems he encountered, his understanding of the issues, and some proposed solutions to those problems. All in 15 minutes. I really appreciate people who don’t pad out the content that they have to present and instead focus on making a high-impact presentation. GNOME Mobile BOF, led by myself: We talked about how far we’ve come, the original goals of the initiative, and identified a bunch of things that we can improve short-term and medium-term. Had a great dinner again on Wednesday, in a tapas bar with some Red Hatters and Michael Meeks, and then on to the party. Wednesday night was the golf club party, sponsored by Collabora, with a free bar until 1 (of which I mostly did not avail – I was being good), and I was in bed by 2. It was a great party, and I picked up another couple of cyclists for the outing I had been planning for Friday, before they wimped out on me. Sunday, Monday and Tuesday were the “core” days of the Gran Canaria Desktop Summit, with cross-desktop and KDE & GNOME specific presentations throughout. I caught a number of presentations, but mostly I was chatting in the hallway track, or doing work on the schedule, or actually working. For me, the story of the 3 days was “parties”. I missed the early sessions on Sunday and Monday to get breakfast at 10am, after the parties hosted by Nokia (Sunday night) and Igalia (Monday night) – I was relieved that there was no party planned on Tuesday night, my 35 year old body couldn’t stand the pace! Great parties, not marred by excessive boozing mostly, and some great chats, notably with jrb, and Adam Dingle and Jim Nelson from Yorba, makers of Shotwell, a Vala photo manager with some really nice features and plans. And some great discussions with Michael Meeks and Matthew Garrett on the fouton during the Igalia party, with Federico Mena Quintero on architecture design patterns, and Jorge Castro on dinosaurs. I also got to meet Joaquim from Igalia, the Macacque band were great, but I’m sure that a hoarse Lefty regretted sweet home chicago and smoke on the water the day after. ConnMan by Not Marcel Holtmann (Joshua Lock from Intel gave the talk in the end – thanks Emmanuele! ): “ConnMan solves some problems for Moblin that NetworkManager wasn’t designed to solve.” (I think). Communicating design in development, by Celeste Lyn Paul: “Keep it simple until they get the design principle, excessive realism too early just makes the discussion about the details”. Unfortunately, I don’t see a video available, highly recommended viewing if there was one. Update: Memory playing tricks with me – for of course, Tuesday evening was the highly anticipated meeting of SMASHED. We finally met at the Mare Baja again, where the opening night party was held, and enjoyed a bunch of tapas courtesy of CodeThink, before scoffing down some great whisk[e]y, including (from memory) a 21yo Highland Park, a nice 16yo Longmorn, a very lod bottle of Oude Ginever from Lefty, an old standard Connemara single malt, and a Yamazaki 10yo I brought. Festivities carried on until after 1pm, when I left with Andrew Savory and someone else (whose name I don’t recall), and Behdad got in an unprovoked fight with the footpath on the way back to the hotel – it came right up and hit him in the face. Some nice KDE people took him to the hospital to get sewn up – luckily the group photos had been taken earlier in the day. Got back to the hotel around 2, and tried to catch up on some of that beauty sleep before Mobile Day on Wednesday in the new conference location in the university.